Peter: The Nike Epic React Flyknit has the latest BIG NEW FOAM wafting over from the Pacific Northwest. I'm always a little leery (and a little excited) when shoe companies start touting the NEXT BIG THING in technology or foam. Sometimes, very rarely, it's a revelation. It was for the Nike Zoom Vaporfly 4% which is a genuinely different feeling running shoe. Most often it's a lot of marketing around a marginally different feeling foam or tech innovation. We should all know by now that despite talk of clouds, pillows, kangaroos, trampolines or any other manner of light, fluffy magic--most running shoes feel pretty similar. It's also really subjective and to further confuse things the same shoe can feel really different on different days. All this to say that Nike has just unveiled the Nike Epic React which they are touting as "a leap forward in lightweight support, durability and responsive energy return". Thems some pretty big words, how does it live up to the hype? Sam: As Peter said Nike is touting React a midsole material and its associated sculpting of the midsole sidewalls and even under foot driven by "computational design". Beyond the tech, the low weight for the amount of cushion stands out. The question to be answered here is where does this playful and elegant looking shoe fit in the Nike line up and thus for runners. Is it a lively, soft light trainer as the Lunar Epic and Lunar Tempo were or a firm workhorse trainer similar to the 2 oz heavier Pegasus or even the stability Structure? 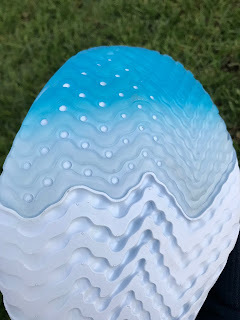 Peter: One of the first things you might notice about the Nike Epic React is the way the midsole flanges out around the heel to create a little ledge. It's a design detail that screams "hey we're doing something different here". They highlight it by making it pink--it's hard to miss and that pink part is very firm plastic ledge. It actually serves a functional purpose, more on that in the midsole section. The shoe looks nice. It has a bootie upper with a big yellow pull-tab on the back and a pretty substantial slab of React foam underneath. I want to like these--perhaps they're a training version of the Vaporfly--perhaps they have that same snap? My first few runs in them left me scratching my head a bit. They're a nice shoe, they fit a little more forgivingly than some other Nike's, but do they have that thing? Sam: I am not a design geek but this is one heck of a spectacular looking and well thought out design. The shoe is made up of a total of 10 pieces including functional Swoosh logos. Each contrasting color that is not the elegant upper blue or stark white sculpted the midsole outsole is in fact a key part of the design and a functional element. Even the outsole with its shades of blue is actually indicates firmness, darker blue areas of the same density rubber are firmer. through their thickness and from the design of the waves. Hats off to the visual designers! Derek: I found the upper to fit pretty comfortably without socks on initial step in. I did not have much difficulty getting my feet into the shoes. The shoe also felt pretty nice and slightly bouncy just walking around. Nothing as dramatic as the ZoomX of the 4% but still a little more lively than the Lunarlon in the Zoom Fly. 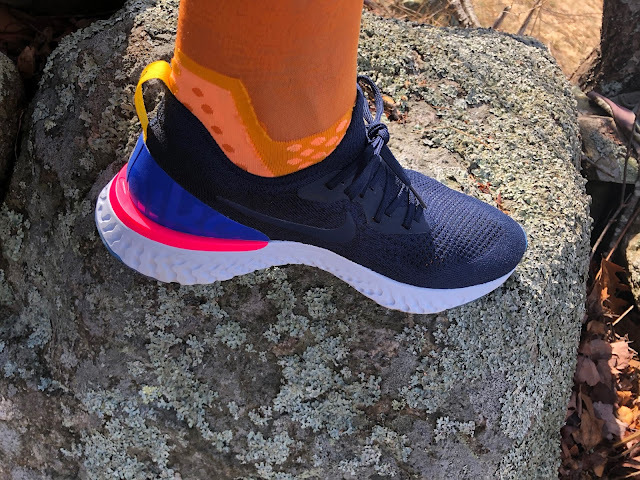 Peter: The Nike Epic React fit true to size. They're made of 'Flyknit' and it feels like Nike has really started to hone their knit technology. The bootie is form fitting but not constricting. You'll definitely want to use the yellow pull-tab to help put your foot in the shoe as there's little to grab onto up front (no tongue, just bootie) or in back (more of a sock than an ankle collar. The good news is that it's super comfortable and holds the foot really well--there's no sacrifice in the feeling of connection to the mid/outsole. There's no slippage for me and the upper pretty much disappears. I do have a couple of issues though. The lacing system is a bit primitive. 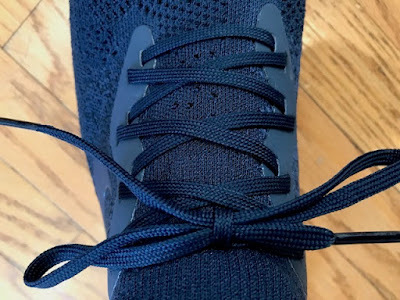 There's no Flywire here (a series of thin cords connecting laces to midsole around the mid foot found in many Nike run shoes), so the laces just sort of slightly tighten the bootie--but they don't do a lot to pull the midfoot section tighter or up around the foot. The shoes don't feel loose, but with the lack of a padded tongue you get into some trouble if you really try to tighten down the laces. I wound up feeling some pressure on the top of my foot from the laces---fortunately and unfortunately this didn't last too long as the laces have come untied at least a couple of times on each run. I think this shoe might have benefitted from Flywire. There's an external molded "heel skin" that helps hold the foot down. Again there's no real problem with fit, but the lacing is a bit lacking. 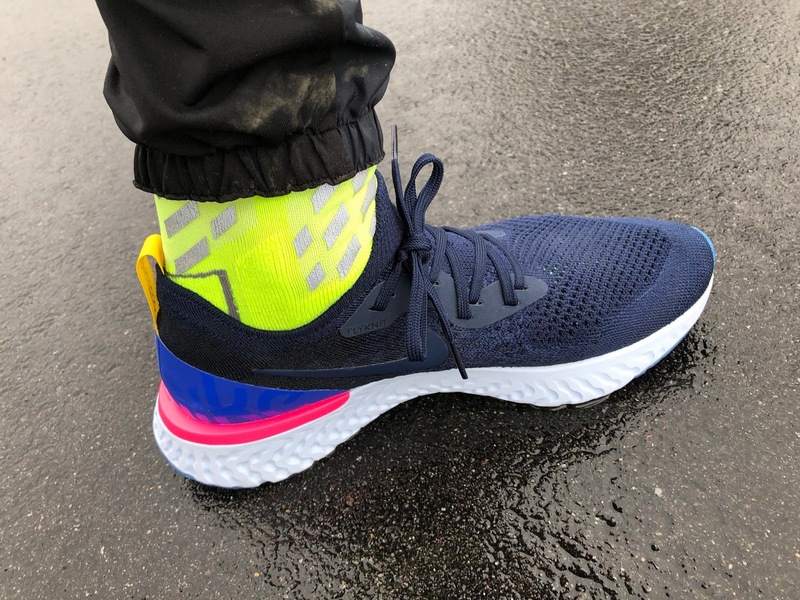 Sam: The Epic React fits me true to size with thin socks. It is among the hardest shoes to pull on when new I have ever had. The yellow pull tab is super functional, essential in fact! Fortunately, after the first run the pull on "exercise" relaxed a bit. This tight pull on is actually a good thing as once in the foot is impeccably, if quite snuggly held a mid foot and there is no slip forward on the run. Knit one piece uppers often suffer from poor mid and rear of the foot hold without the addition of plastic cages, straps from lace up to heel, fancy external heel counters extending forward and other tricks. Here Nike has pulled off the knit upper with no additional awkward looking or functioning tricks. Unlike Peter I had no issues whatsoever with the lacing or tongue padding. I did discover, and should have remembered from other knit uppers that the laces do not need to be cinched tight at all as the knit upper does much of the foot hold work. Derek: The shoe fits true to size for me. The upper is very thin and snug and provides very good ventilation for running in warmer conditions. It is my favourite knit upper in the Nike range; very well executed. With socks, I quickly found that there was a bit of inconsistency with the shoe volume for my feet. I had to stop and adjust the shoe two times during my first run in the shoe. 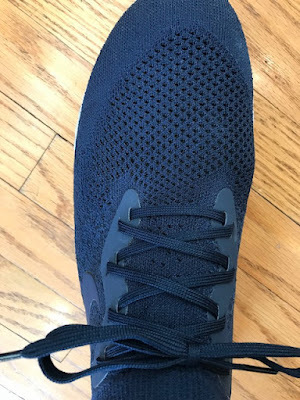 At first I had overly tightened the laces, and was getting severe aching in the arch and lateral part of the midfoot within 5 minutes of running. It was so bad I decided to try running sockless. This made the midfoot woes go away completely, but then I was getting a bit of heel rub from the internal padding of the heel cup, and after another 10 minutes I feared I might develop a blister right at the junction between the padding and the knit collar, against the Achilles insertion of my ankle. So I stopped and put the socks back on, and this time I completely slackened all tension in the laces and finally the shoe caused no aching. The fit was a bit loose in the heel without lace tension but with socks on and I could feel my heel moving about a little in the shoe, but I was able to avoid any blistering. Overall I think the shoe has a good width toe box (though a little low in terms of vertical height), and a good volume heel, but the sharp narrowing of the midfoot platform may cause some grief for people with low arches or wider feet. Just a 2-3mm less aggressively curved last would be fine. I should point out that I have no arch pain with the Streak 6, Zoom Elite 9, or Vaporfly 4% so I can handle narrow lasts for the most part. 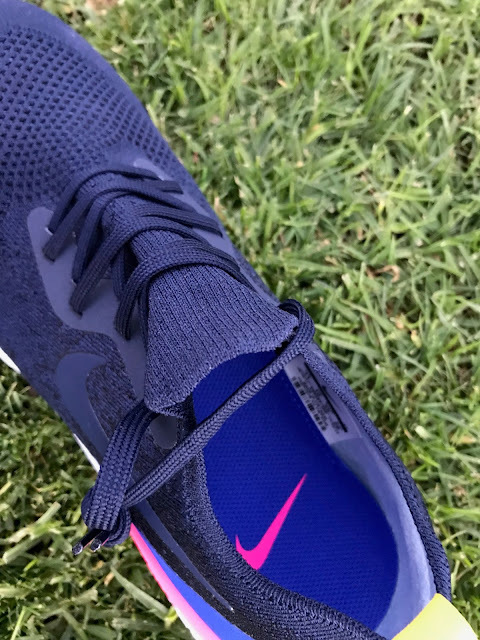 Part of the problem might be that the midsole runs up the lateral side of the midfoot just enough to influence the fit for me, but this might be a key stability feature that Nike incorporated into the design of the shoe. Of course, with the current lace configuration, there is little room for creativity in terms of lacing adjustments. 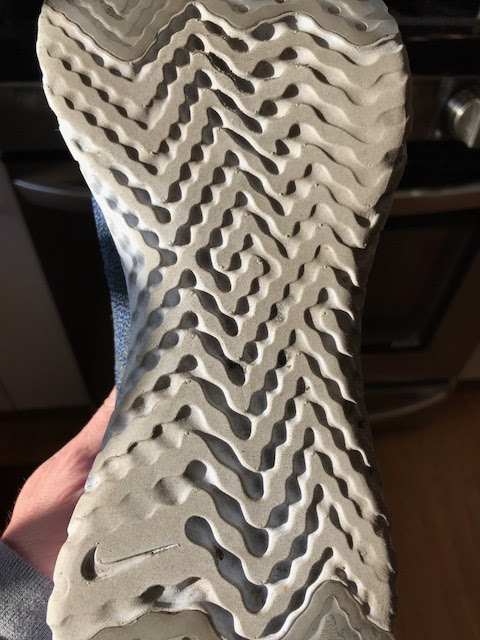 Peter: The React midsole technology, the foam itself and how it is sculpted, is the "big story" here. Nike describes it as 11% softer and with 13% better energy return than Lunarlon foam, the prior softer Nike foam, and more durable. The Epic React was finalized after 400 different combinations of chemistry and processing were evaluated and 17,000 miles run. 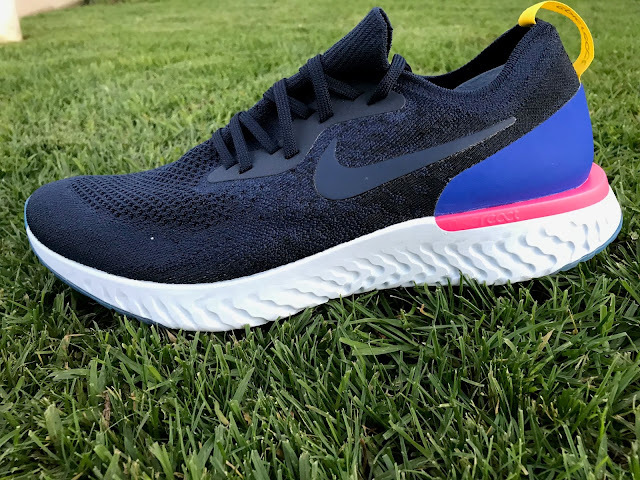 Nike says: "As a direct comparison to the Nike LunarEpic Flyknit 2, the Nike Epic React Flyknit is 5% lighter, 11% softer and provides 10% more energy return." I'll get into comparisons to Lunar foam shoes later in the review to give you my take. The heel flange, its pink highlight and all is functional. With such a soft foam, significantly softer than EVA foams, to prevent bottoming out the tall midsole, and to provide a supportive base Nike extended the midsole beyond the perimeter of the upper. Beyond the single slab of React foam and the flaring flange, Nike used "computational design" to sculpt React midsole sidewalls and as well as unusually the underfoot, into zones of cushion and firmness and to reduce weight. Recall Epic React is a 7.8 oz higher stack shoe. The intricate sculpted patterns is based on athlete heat map data. In contrast to New Balance's Fresh Foam which focuses on sculpting the sidewalls, here the underfoot midsole is also culpted and there are only 2 small front and rear patches of rubber "outsole". 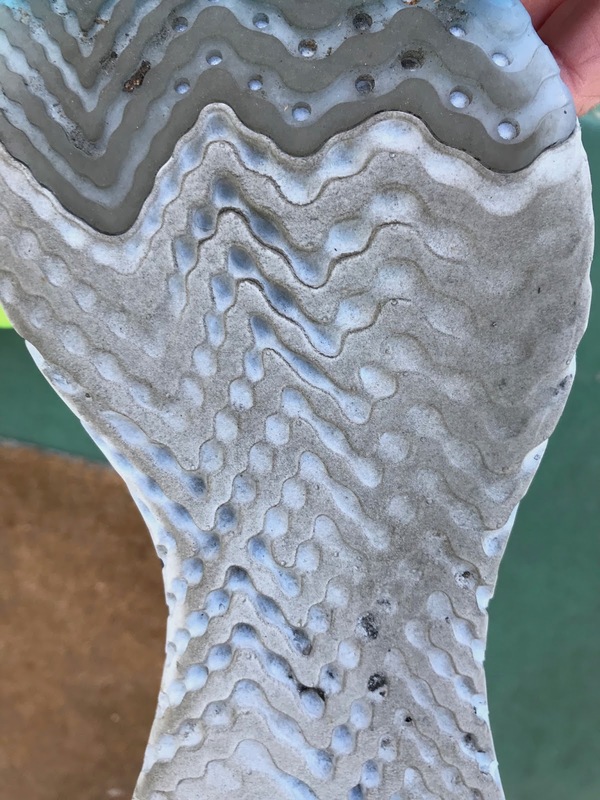 This midsole which is really an outsole is "where the rubber hits the road" and a factor in how the shoe feels on the run. Deeper more pronounced cavities provide cushioning or give, more extensive flat, shallower surfaces firmness and support. In the picture above the flat surface with Swoosh can be expected to be firmer and provide more support on the medial side than the deeper more open pattern on the lateral side to the right. Likewise the area towards the top at top right if the technology delivers should be slightly firmer than the left medial side. It is an data driven approach, with sculpting and all similar to New Balance's Fresh Foam technology but here the sculpting goes beyond the midsole side walls to the midsole exposed to the ground. Sam: Bottom line, despite what Nike says, this is not a soft midsole or much softer than the Lunar Epic and certainly not as soft as the Lunar Tempo on the run for me. It is far firmer feeling than the VaporFly as well. The midsole has a dense firm but well cushioned feel and one without a great deal of character or road feel. Wait a minute but Nike said 11% softer than Lunar Epic.. and indeed I measured the midsole at a very reasonably soft lower 30's C so that could be. 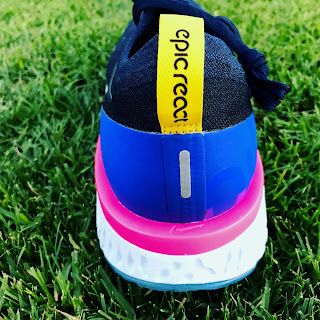 What the Epic React has which the Lunar Epic and Lunar Tempo don't have are the very firm patches of outsole rubber and that pink stabilizer piece, a very hard plastic around the heel structure. The firmness feel can also come from a denser but still "soft" foam. To complicated for me, but I have wear tested varying densities of the same firmness foam and felt differences,. As for the energy return, It could be there, but it is not as evident or smile worthy given the midsole density or firmness as in the VaporFly's Pebax, Boost shoes, Skechers' Flight Gen or Reebok Float Foam also a Pebax type foam. As with the upper, the priority here seemed to have been on stability, support and a firmer ride and not lively bounce. Derek: I actually found the midsole feel to be fine. It may not be the pillowy springy feel that the Nike advertisements were touting, but it is certainly soft by Nike standards. Apart from the Free RN Distance, Vaporfly 4% and the now discontinued Flyknit Lunar, I cannot think of a softer feeling Nike shoe, especially in the midfoot, where all the exposed React foam sits. Is it softer than the Lunaracer/LunarTempo? I can’t say for sure but it certainly affords less ground feel and much better vibration dampening, perhaps courtesy of the higher stack. The outsole appears to influence the feel quite a bit as well, as I do notice that the heel and forefoot have a little more solid underfoot feel than the midsole. I can almost feel the exact point where the shoe transitions from exposed React foam to rubber as I toe off. 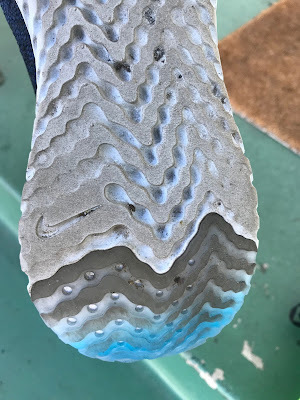 The big question that seems to have come up is durability, ironic, since one of the big marketing points was the high durability of the React foam. I have put in about 20+ miles in the shoe so far, and there is some rubbing off of the React foam at the lateral heel and medial forefoot but nothing major. I have noticed no deterioration of the ride of the shoe so far. The jury is still out on this one, whether it will be an issue after 100+ miles. Peter: Your foot essentially sits on a bed of React foam. The only rubber "outsole" elements are small sections of the toe and heel. They are given a relatively thin patch short patch of rubber (that is perhaps similar to the 'crystal rubber' in the Saucony Freedom. I'm not sure about the exact firmness data, but it's a reasonably soft rubber when pressed upfront due to its thinness there compared to the thicker heel rubber. I don't find it to be super duper bouncy. 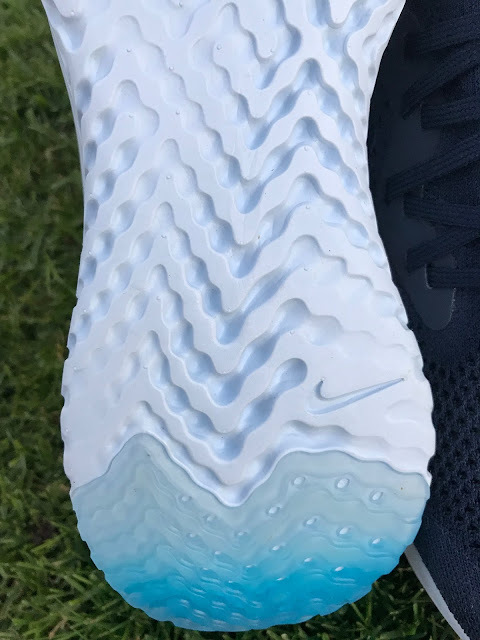 It'll be interesting to see how the exposed React foam will hold up after more the miles, I'm already seeing some wear. Sam: The outsole is a very firm rubber which I measured at about 70 C on my durometer. In fact I heard tap tap walking down stairs.. Not to worry, it is not a slappy outsole or shoe. As noted above, the darker the shade of blue the firmer the outsole. This color shift and firmness bump may be achieved by increasing thickness and at the toe decreasing the width of the gap between ridges. The heel outsole seems to work well but I do think the combination of that firm rubber and the pink flange make the heel almost overly stable and to firm. A bit of give would be nice. Peter noted a dead feeling at toe off. I feel something similar but think what I am feeling is a to rapid transition from softer midsole to hard front rubber. I think the front rubber starts in an odd place, to far forward so the foot has to adapt to a change as we try to toe off in an unexpected place. After my first 20 miles, the flex improved considerably with the shoe gaining a snappy flex point right about at the last lace hole, but as with other such one piece "crystal rubber" outsoles such as on the Saucony Freedom in front of that things are relatively stiff. I wonder if this shoe might not benefit from a longer rocker, longer front outsole coverage, softer rubber, and or deeper and wider grooves to get a longer softer flex to better match the midsole. Peter: It's hard to know what I would have thought of this shoe and foam a month ago. In the past month a couple of things have happened. A lot of hype about the Epic React and a little shoe called the Ride 7 from Skechers Performance. The Ride 7 came along with little hype and blew me away. 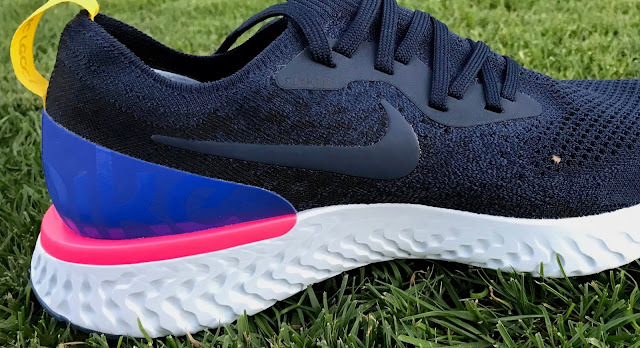 It's all of the things the Nike Epic React is claiming to be: soft and bouncy. There's some magic in that shoe--but back to the shoe at hand. I like the ride of the Epic React. It seems to give more energy back if I really start running hard. At slower speeds it's nice. It's a stable and soft-ish ride. I think, for me, it falls into a middle ground of being too soft to feel fast and too firm to feel cushy. Each of my runs in the React has been similar--I don't love it for the first 10 minutes, I like it fine for 40 and then I really like it for 10. My biggest issue with the ride is that the forefoot feels just slightly dead to me. Could that be the outsole rubber over a soft midsole leads to a lack of toe off pop?. It reminds me of the Freedom in the way I land and seem to hang out at the forefoot for just a millisecond--if you can imagine the difference between how a brand new tennis ball feels coming off of a racket vs how a ball that's been sitting for a while. The React feels like the older ball. Sam: This is a ride for Nike fans who enjoy the Pegasus and Zoom Streak, and less so for those who enjoy the softer feeling Vomero, Lunar Tempo and Epic fans. The ride reminds me of Asics Flyte Foam and New Balance Fresh Foam, also a single slab midsole with computer driven midsole sculpting, more than Nike's Lunarlon. My first run was a recovery 5 miler. It was no fun. The firm ride at slow paces, and given the shoe was new and stiff, made it a chore and did not help my legs recover that much. My second run was a 12 miler at slower tempo paces. Things started off well with a lively, firm energy return but as I got tired the firmness started to wear on me and my pace dropped off slightly. Yes I was in the middle of a big week and my legs were sore, but here you have to work pretty hard here to sense that energy return given the dense feel to the midsole and get an efficient transition. The ride is on firm and dense feeling side but not overly harsh but does not exactly brings mid run smiles. Despite the playful looks it's all serious business here, maybe to much data driving design and not enough design by feel? The stability and support was fabulous reminding me in some ways of the Skechers Forza 3 with a more neutral geometry to the mid foot midsole but similar support. The Forza is notably stiffer, has a tri-density midsole close to the same firmness overall in feel, a better designed continuous full rubber outsole and transitions smoother for me at all paces. This could be because its rocker sole starts approx. 1/2 inch, 13 millimeters further back than React's. Derek: It took me a while to sort of find the sweet spot for this shoe, and it seems to feel best when I land as square on the shoe as possible, to get as much React foam ground contact as possible. This allows for the greatest compression and deformation of the foam and gives it a subtle bouncy quality, that while some people may find dull and uninspiring, I find to be really good at tuning out the harshness of running on concrete pavements. Once you can find that sweet spot and stay there, it runs very smoothly at moderate paces. If you land more extremely on the heel or forefoot, you will find that the ride becomes a little bit firmer and less inspiring. I took the shoe for a few moderate pace runs and a few easy runs with hard strides on the track. This shoe can definitely handle surges because the relatively wide and firm forefoot feel creates a very stable platform for toe-off. I found sprints and strides to be easier in this shoe than the similarly weighted Zoom Elite 9 and Zoom Fly SP(both around 8oz for my size), both of which are a little softer in the forefoot. In terms of underfoot feel, compared to shoes I’ve worn recently, it sits in between the Skechers Forza3 and Ride 7 in terms of firmness, and runs softer and smoother for me than the UnderArmor HOVR Sonic (mainly because the low drop and lack of rocker in the HOVR seems not to work so well for my stride). 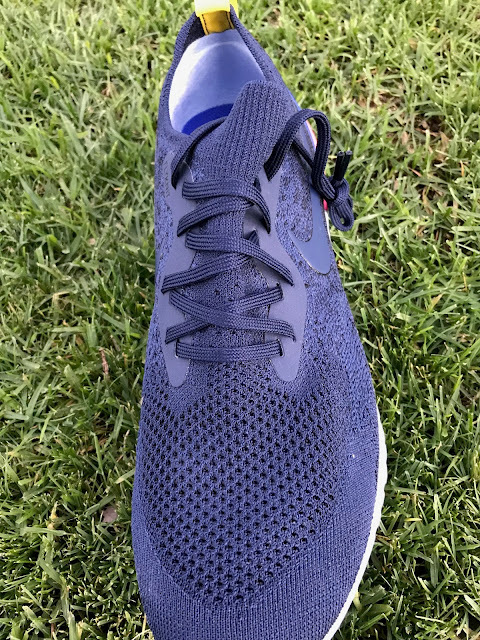 Peter: This is certainly not the poor man's Vaporfly, but it's a pretty versatile lightweight shoe that can handle long miles and fast stuff too! The Nike Epic React doesn't quite live up to the marketing hype surrounding it, but it's worth running in. I'd like to see some refining of the lacing and perhaps a little padding to the top of the tongue area. They fit a little more forgivingly than other Nike and I think they look great. They're certainly worth a try--I think many people will experience a great mix of softness and bounce and like them. The more I run in them, the more they grow on me, and though they don't thrill me, they're a pretty good all around shoe. Sam: I agree with Peter that the React does not have the silky smooth, soft and dynamic ride of the VaporFly. It is more like a Zoom Fly' or Pegasus cousin if one is looking at new Nike offerings. It certainly isn't a soft lifestyle oriented shoe such Ultra Boost. I have no inside information, but it seems to me that the React is intended to be a firm, stable, supportive work horse trainer for Nikes elites. Galen Rupp, I understand a big fan of the Structure and Pegasus, was involved in its testing. So it is a shoe along the lines of the Pegasus but 2 oz lighter, "computationally designed", with a spectacularly well executed modern visual design, and also dramatically simplified in terms of manufacturing steps, labor and waste-I count 10 pieces or apparent assembly steps to the React and at least 30 to make a Pegasus. Nike should make big profits from this shoe while reducing environmental impacts. I agree with Peter it is a fine shoe but it seems to lack soul and joy for me as do most Nike for me (except recently the VaporFly 4%, my 2017 shoe of the year and the Terra Kiger). Most often this is due to their overly firm and lumpy rides. Here there is no lumpiness that's for sure but I only feel bounce and a dynamic lively ride at faster paces when fresh, and no runner is always fresh. The React would be great if it relaxed a bit, got softer and more lively-ironically to better match its fun looks. 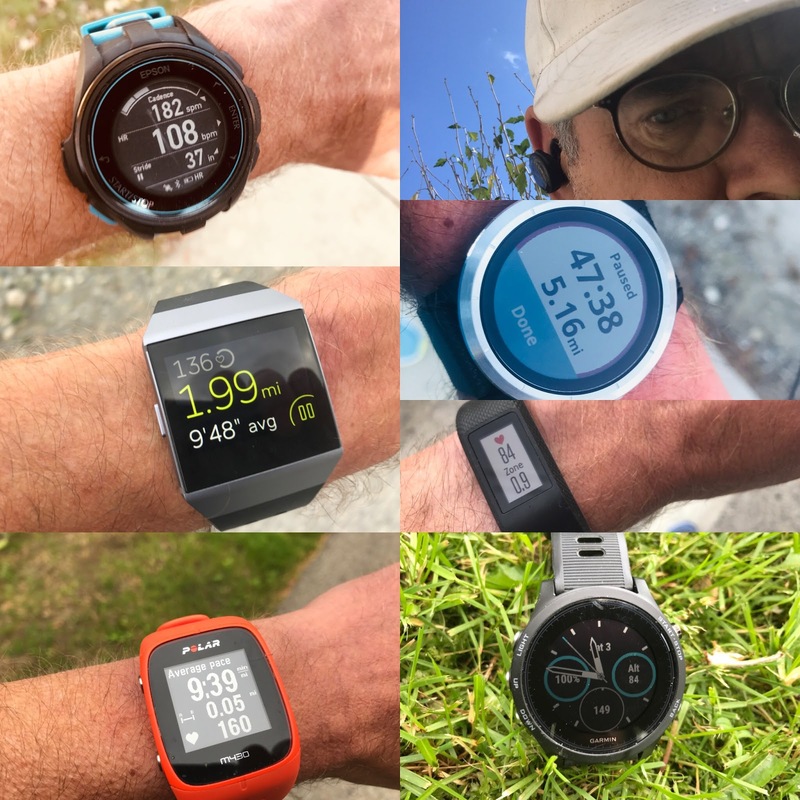 It would be "OK" if it lost some of that computed heat mapped efficiency as it is as much what we feel as runners as the computations that make a shoe and our runs enjoyable and fast. Derek: I think overall, React has promise as a running foam, and would work well for daily trainers or uptempo trainer, if its durability holds up. The only thing holding me back from using it for long runs is the upper. I am always thinking about the upper because every once in a while I just notice the arch running a little narrow when I’m running. One has to remember that the Epic React is soft by Nike standards. Their daily trainer, the Pegasus is firm, their supposedly softer Vomero, is also fairly firm by premium daily trainer standards. I see the Vaporfly and Epic React as baby steps in the direction of the current market preferences towards a softer ride. I look forward to seeing React in a more conventional upper and outsole configuration. Something with the upper, last and outsole of the Zoom Elite 9 would be perfect. -1 for overly firm ride, lack of fun on the run and labored transitions at slower paces. -0.5 for awkwardly located front outsole and short rocker. - The foam characteristics are not quite what I expected based on the marketing but is nice in its own subtle way. Peter: The UA shoe is a much firmer ride. These are both decent choices that can run long but also speed up nicely when you need them to. I think the upper on the Under Armour is more elegant and as a whole works to hold the foot better. If you don’t mind a slightly firmer shoe, the UA may be the way to go. Sam: Both have spectacular, modern looks and designs. While the outer carrier foam in the HOVR is firm, the inner core is soft and truly bouncy in a nicely controlled way by its web net covering. Due to the very full heel rubber coverage the HOVR is clearly firmer at the rear while for me more fluid and with more ground feel towards the front of the shoe. The HOVR upper will fit more feet and is more comfortable. HOVR handles all paces more elegantly, if more leisurely than the React and is $50 less. Derek: The Sonic has the firmer ride for sure. The Sonic has the good upper with the ok ride, while the Epic React has the ok upper with the good ride. I think the React works better for heel strikers while the low drop of the Sonic works better for mid- and forefoot strikers. Pricing-wise, the Sonic wins hands down. Peter: Nike compares the React foam to Lunarlon so I will too. They say 11% lighter and 13% bouncier. Well, compared to the Lunaracer side-by-side they are definitely softer and bounce more, but Lunaracer is more of a, um, racer. Totally different feeling shoes. Derek: I think the React handles the slower paces a little better as it has the softer heel and midfoot, and better vibration dampening ride. React transitions a little slower at faster paces, partly because of the soft midfoot, and partly because the Zoom Fly has the embedded plate which creates a nicer rockered transition. Overall, it comes down to whether you want a softer ride for training, or a faster ride for uptempo running and even long distance racing. Peter: I know the React foam is supposed to be magic, but these feel pretty similar to me. In fact, I feel like the forefoot of the Lunar Epic is much more lively—and it is an overall livelier shoe as it has soft Lunarlon core in a co molded carrier foam and a fuller outsole. It does, however collect a ton of pebbles which the React does not. Sam: Totally agree with Peter and prefer the Epic. It is heavier but not noticeably so on the run. I don't care about the obnoxious pebbles sticking in the siped outsole. Derek: I actually prefer the React here. React is the bouncier and more flexible shoe for me, with better vibration dampening. Another plus is that you don’t get stuff stuck in the outsole of the React, unlikely the Lunar Epic. Peter: Man, this is a tough one. I’ll just say it…The SP Ride 7 is what the Nike Epic React wishes it was. It’s bouncy, it’s relatively light although not as light as the Epic at 9.2 oz vs 7.8 oz, and it sings. The Epic React is a bit firmer than the Ride 7, so if the Ride 7 is too soft for you, you may want to try the Epic React. Sam: Ride 7 is softer, less stable for sure, and has a more dynamic ride. It is a much more fun shoe to run but I would pick the React if I had to chose one shoe for heavy heavy mileage running and preferred a firm stable ride. 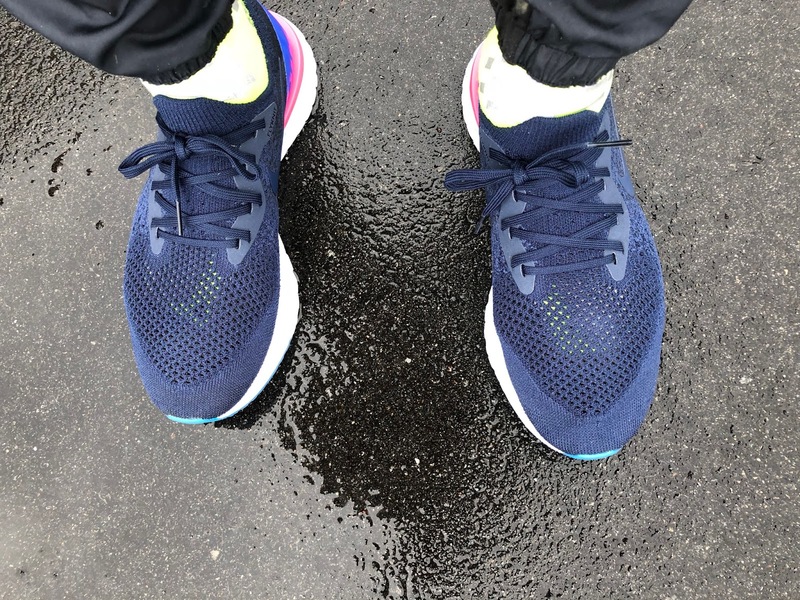 Derek: For shorter moderate pace runs, I would prefer the React as it has the firmer ride, and I find that I am fighting the shoe a little with the much softer underfoot feel of the Ride 7. For long and easy runs, there is no question I would go for the Ride 7, with its more comfortable and accommodating upper and of course softer plush ride. Having said that, the two shoes are almost in different weight categories, with the React in more of the lightweight trainer weight range and the Ride 7 being more in the daily trainer category. Peter: Similar weights here, but the NB 1400 V5 is a lower stack racer that feels invisible to me. There’s definitely more shoe under-foot with the Nike, but I’ll take the NB all day long. Peter: Both are full contact slabs. The Epic React feels more lively and more fun to run in for me. The upper of the Nike has more space than the NB. Peter: Totally different shoes with the ZE9 weighing a touch more, I don’t know why I put them side by side. ZE 9 is WAY firmer and faster, but can still run long. I’d say the Epic React is a long-run shoe that can speed up while the ZE 9 is more of go-fast shoe that can go long. Sam: While I don't care for the Elite's soft heel for racing I would pick it over the React for general training but the React for heavy mileage. Sam: I clearly see the React as a lighter alternative to the Pegasus in the Nike line up. Both are firm, stable, supportive shoes. I slightly prefer the fit and ride of the Pegasus, despite its lumpiness but really feel its additional weight. Very slight nod to Pegasus for its versatility but neither are my ideal kind of ride. I am eagerly awaiting the rumored Pegasus Turbo with the Zoom X midsole of the VaporFly! Sam: Slightly heavier the Pro is smooth and transitions beautifully at all paces. It has a firm but not as firm or as jarring a heel as the React, a soft mid foot, and excellent well placed forefoot rubber. Its upper is more accommodating but I might still give a slight nod to the React's. Overall the Pro is more versatile and easier on the legs given its effective vibration reduction tech at the heel which takes the edge off the firm midsole. Sam: Sort of in different categories as the Forza is a light stability shoe but nonethelessI found the React also had stability characteristics as a neutral shoe. Forza's stability is seamless in feel so you have a fairly firm smooth transitioning shoe with a great upper. While the React will out perform the heavier Forza at faster paces, the Forza will give you a smoother slightly more stable any pace ride. Sam: At about the same weight the Mach is softer in the heel using a midsole bucket seat instead of the hard plastic flange of the React for stability, about the same firmness in the forefoot with a less jarring ride and a smoother front transition and better longer flex. Nod to Mach. Peter: There are some similarities here. I had a problem with the forefoot of the Freedom feeling a bit dead—almost pausing for an instant mid stride. I have the same issue with the Nike Epic React. The foams may be pretty similar here. There’s more shoe underfoot for the Nike for better or for worse-depending on your preference. The Freedom is a bit more invisible, but the Nike holds up much better for me over longer miles. Sam: The Freedom is more fun to run but not very stable either in its upper or midsole. It is soft and bouncy but if heavy mileage in a shoe is your need go with the React. Peter Stuart is a late 40's avid LA based runner with recent sub 3 hour marathons and sub 1:25 half marathons. Peter's React was provided at no cost. Sam and Derek purchased theirs. The opinions herein are entirely the authors'. Great review, you right about all the hype, some say its going to be a the best thing since adidas boost. I am interested in your thoughts how it compares with the ultraboost with its comfort, responsiveness etc. Between the saucony freedom and epic react which do you find the best shoe to run in for both short and longer runs, is the freedom a faster more responsive shoe and as comfortable and soft. The sketchers gorun 7 seems like you prefer that shoe, is it more versatile and as fast and as breathable in the upper as I live in a hot climate. Which has the most cushion out of those 3? Thanks. Peter...thanks for getting out an early review. I'm also liking all the comparisons from you and other reviewers on all the shoes. Any thoughts on comparing to the Reebok Floatride? I like your tennis ball analogy. What would be a few neutral, cushioned shoes that feel like a "new tennis ball?" This is why I keep coming here for reviews. You don't get the "this is the greatest shoe ever" review and you don't get the "this is the worst shoe ever" review. And thank you for not using the term "like running on clouds"...I am so tired of reading that in reviews. And the comparisons is something you don't get on other sites. I think I will stick with my Skechers rotation for now. GRUR2, GRR7, and the GR6. I've had these shoes for a few weeks and they are what Nike says they are. Light. Soft. Bouncy. Fast. They check all those boxes. They also feel exactly the way Peter describes them - too soft to feel fast and too firm to feel cushy. Having said that, they don't feel fast but they do wind up being fast and doing a good job of energy return. I'm a big fan of the way the NB 1400s feel and these don't have that great feel but they do check all the boxes that Nike is promoting. Nice review! How is the support in the shoe? When I run I tend to overpronate, so I would love to know if these would fit me. Right now I'm using a pair of Asics GT2000. Thanks for kind words! All of us try to be objective, detailed, and fun in our reviews. 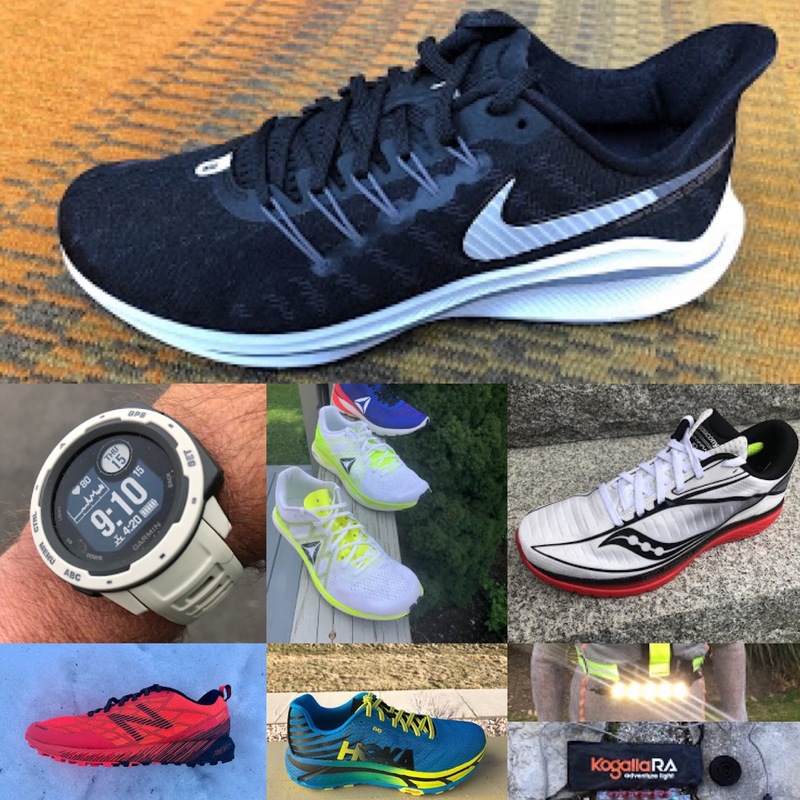 Shoes these days are all "way better than average" and the differences often slight when you get right down to it and the ride and feel coming down to runner preferences. We try hard to compare to give context. Thanks for asking. We all pronate to one extent or another and latest research indicates many runners are "over prescribed" heavy duty stability shoes. The GT2000 is more moderate but still a motion control shoe. I know Peter our reviewer is not a big fan of pronation support in his shoes. I do like a bit but no hard posts although I mostly run in neutral shoes. I just got a pair of React and will test them this weekend and add to the reviews as well as answer your question. although I see no overt pronation control features in the React. If you still want some pronation control or better said support and guidance of the mild variety other great options exist and way lighter in weight than the GT2000 including the Skechers Forza 3, Hoka Arahi, new Salomon Sonic RA Max, and Brooks Ravenna 9. See link below for reviews of all of these and many others. The reviews on this shoe leave me flat.....the "wow" factor for $150 is missing, especially as I'm a mid/forefoot striker and that's where I want the "wow, that feels good" in my shoes. I'm a bit discouraged about my Zoom Flys for that reason, although there are so many other positives about the ZF's that I'll keep them (or at least 1 or 2 pairs of them....) Everything I've seen from you guys and others in the Shoe Geeks FB group makes me what to get a pair of the Skechers Performance Ride 7 instead of the Reacts. And, I'll keep on searching for older models of the Lunarglides (4's and 5's) on Ebay, my all-time favorite shoe. I have been reading your column since it’s advent. Over that time, I have been amazed at how our opinions mirror; saving me both time and money. Rather than trying every shoe of interest, I just read your column. If you like a product, I know I will feel the same. If you shrug, I shrug. If your head shakes, mine is in unison. It has been a meaningful relationship. Then along came the Nike Epic React. I was hyped into a purchase before your review. I loved the shoe and knew you would too, and so I waited. Your review came, and you shrugged while I gushed. You criticized while I applauded. I thought they were the best thing since toilet paper, while you thought they resembled what the paper wiped. Sam, I know we can get past this. Going to try to get our hands of the Odyssey. Would this shoe be able to handle long distance run like a full marathon? Absolutely Epic React would be a good marathon choice, plenty of cushion at a light weight. This said one needs to make sure the snug upper works for you. Over the miles of a marathon feet swell and issues could arise. For example Nike"s top of the line VaporFly has considerably more room for me at true to size. Thanks for the reply Sam. 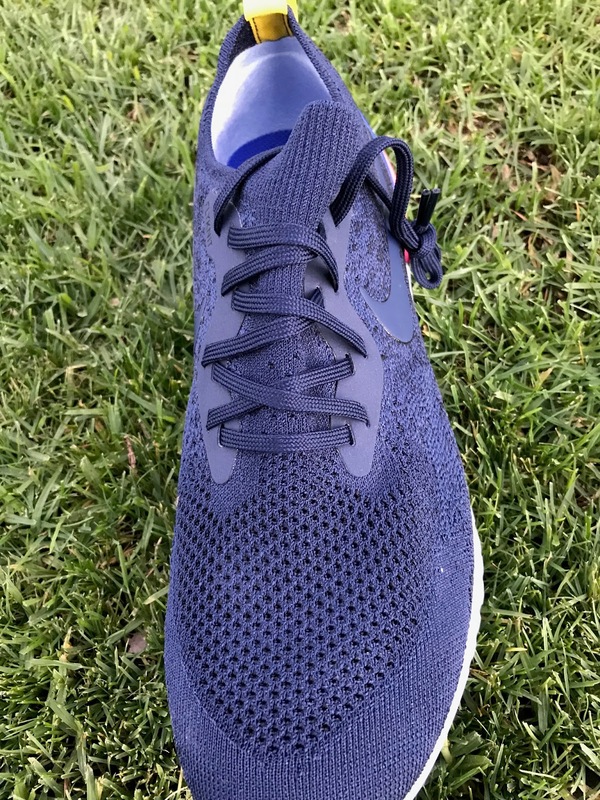 How snug is the upper compared to Pegasus 34? Compared to Pegasus 34 quite similar but Peg has a bit more toe overhead room due to its less dense mesh and given mesh plus Flywire can be worn less snug at lacing and still be well held. For me the Peg upper flexes better with the foot than Epic.Epic is a touch less snug over the top of the foot at the lacing mid point.